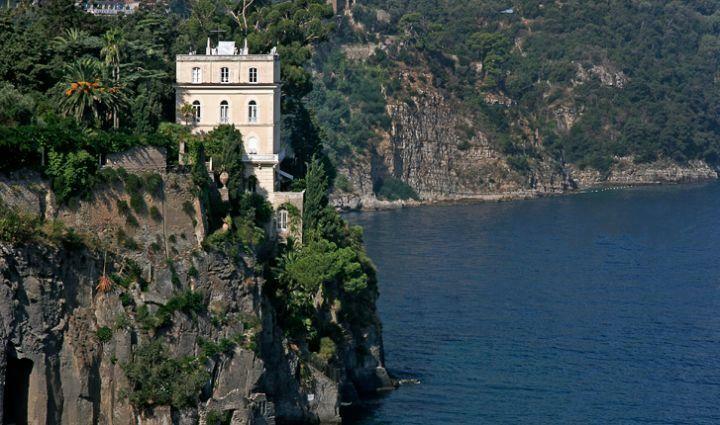 This is the most luxurious Villa on the Amalfi Coast. 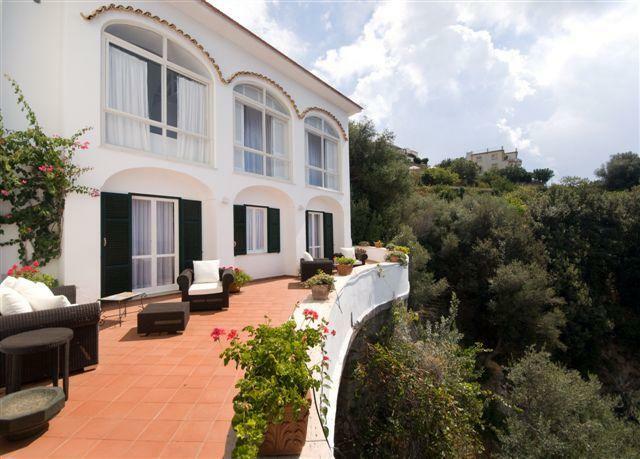 Located in Praiano, the property was owned by a noble Neapolitan Princess, who built the first structure of the villa at the beginning of the 1900's. After being sold to a Chilean consulate, it then changed hands into a pair of famous designers, who owned the property from the 1980's through recent. 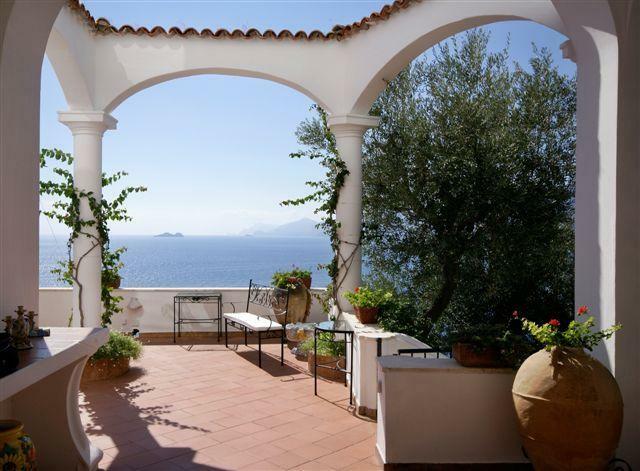 It was at this time that the villa underwent a conformation to elite destination, hosting many international figures, such as Racquel Welch, Donna Karan, Julia Roberts, and Michael Keaton, to name a few. The property still enjoys some of the original décor pieces from ancestors of its first proprietor. 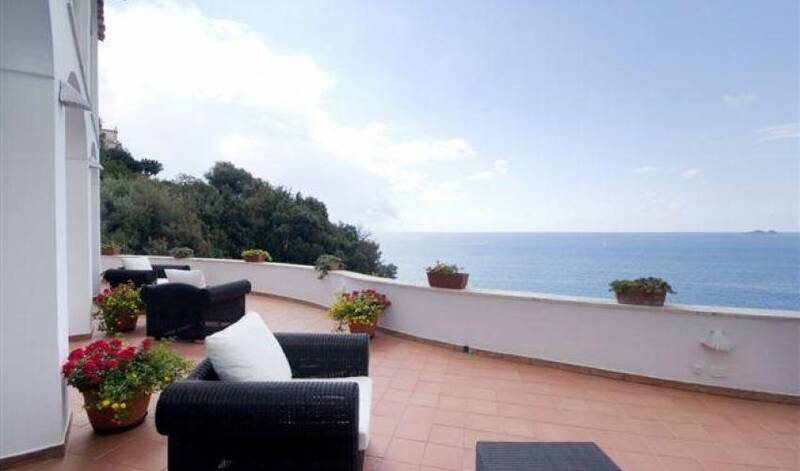 The Villa, a nice mixture between modern and rare, is situated approximately a two minute walk from the town's main Duomo, then down 153 steps to the main, gated entrance, however, arrival by sea is also possible. Situated right along the coastline, the property enjoys a private entrance by sea, up a flight of 202 steps that take you from the beach to the villa's pool deck. 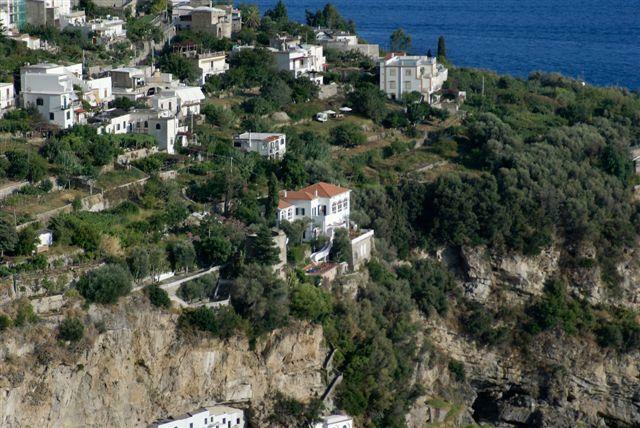 In fact, to get to the villa, via the Duomo of Praiano and the main Amalfi Coast road, all you need to do is follow signs to the beach. Entrance into the property is through a portion of the private garden into a small study where a laptop lay at guests' disposal (wireless Internet throughout). The format of the property allows for guests to flow from the rooms out onto the large, panoramic terraces that surround the property. The entrance study leads, straight ahead, into the large kitchen, where two, large wooden dining tables for 12 guests sit below large chandeliers. The new kitchen is fully equipped with a 6-range stovetop, oven, microwave, American coffee pot, and many more accessories all at guests' disposal. The living room, also situated off of the entrance study, is a large, modern double living room with white décor, 17-foot high ceilings, and access directly onto the large, panoramic terrace. 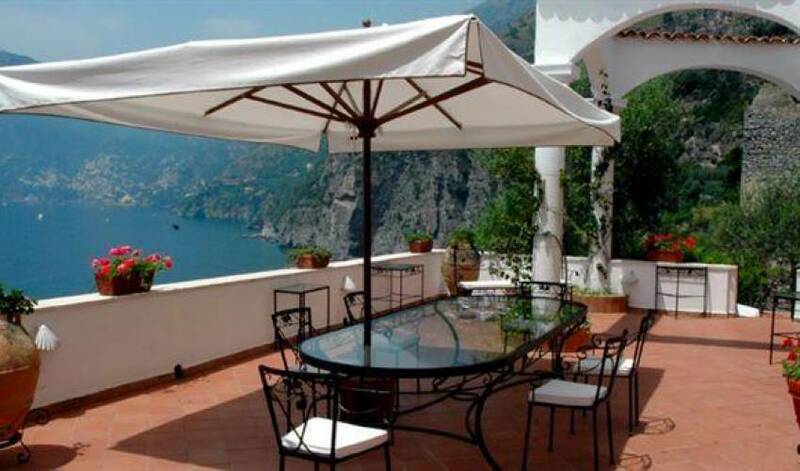 The terrace enjoys large, white sofas, a day bed, fireplace, and décor pieces (silver candelabra, small vases, etc.) situated throughout. The living room also has air conditioning (as does the rest of the house). The living room leads you down a corridor, which takes you to the first two bedrooms. The bedroom at the end of the corridor is a large, double bedroom with air conditioning, a fireplace, and direct access out onto the terrace. The second bedroom off of this corridor is not usually used during rentals. 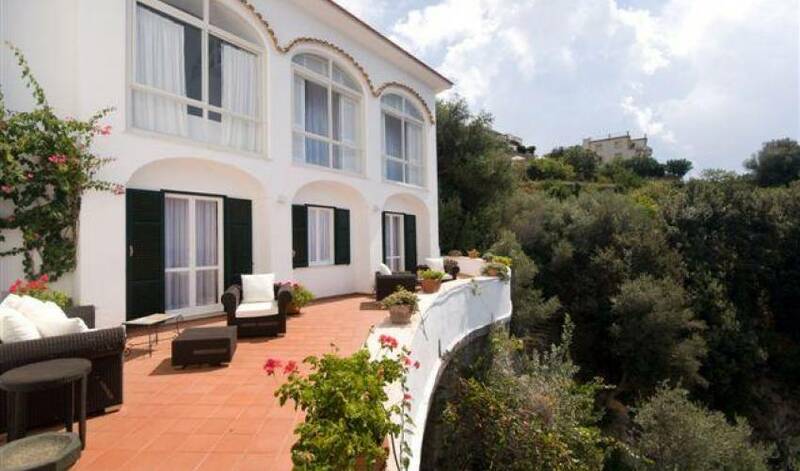 It is a double bedroom with access out onto the large, panoramic terrace, however, as we tend not to rent this property to more than 10 people at a time (enquire during reservation), we leave this bedroom locked, allowing guests to choose between the remaining 6. These two bedrooms share a bathroom (which, as the second bedroom is usually not rented, becomes the bathroom for the bedroom found down this corridor). The large bathroom enjoys a shower. The second floor of the house, found up a two flights of steps (30 total steps) off of the entrance study, consists of two master bedrooms, each with en-suite bathroom, and a large, triple panoramic living room, all enjoying vast amounts of natural light. The first bedroom suite has modern, white décor and large, panoramic windows looking out over the Mediterranean and the Island of Capri. The queen size double bedroom enjoys a small, internal sitting room with several chairs and a small breakfast table, fireplace, flat screen TV, dresser, closet, and several bedside lamp tables, while fresh flowers perfume throughout. The en-suite bathroom enjoys a panoramic bathtub overlooking the coastline, with showerhead and separate bidet and toilet area. The bathroom enjoys white, ceramic tile floors and lots of light. The second master bedroom, also found on the second floor, boasts a separate sitting room with day bed (which can be used as a single bed) and access to a small terrace. 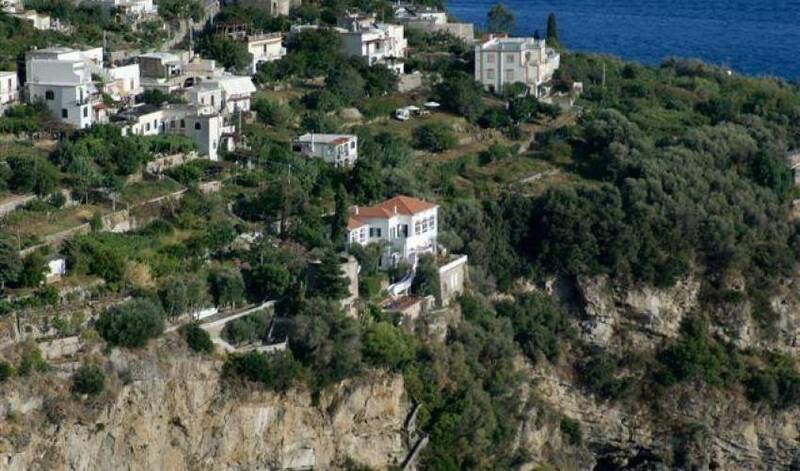 It flows into the master bedroom with large double bed, 42 inch TV, fireplace, electric curtains, and large, panoramic windows overlooking the Mediterranean. The large, en-suite bathroom enjoys an ancillary make-up room, and bathroom with shower. 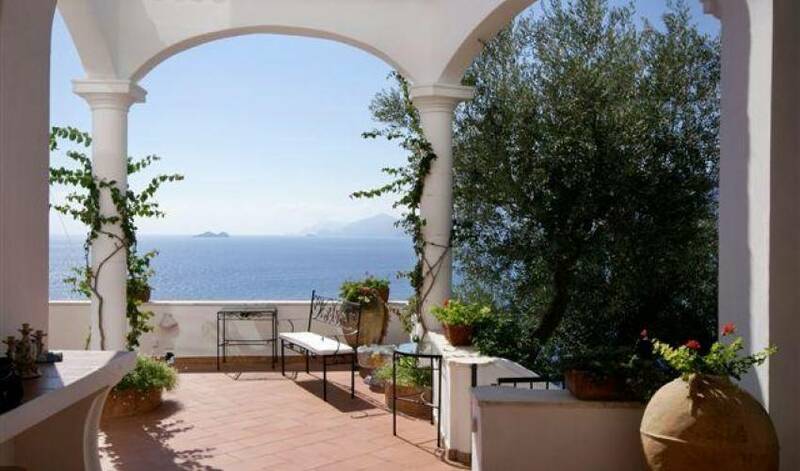 The large living room found on the second floor also enjoys a large fireplace, an L-shaped sofa with coffee table, large, panoramic windows with views out to the Island of Capri and the town of Positano. The living room also enjoys entrance out to a small breakfast terrace with a ceramic table and chairs. 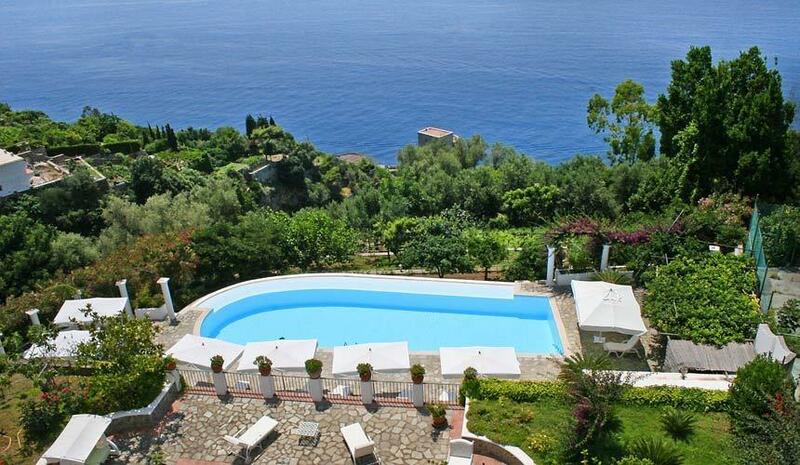 The remaining three bedrooms are all annexes, from the guesthouse found on the pool deck, to the ‘beach front' apartment, to the tower annex, housed in a tower over 1,000 years old. The pool suite has entrance through its small kitchen (with small refrigerator, sink, and two range stovetop) into the double bedroom with dresser. The pool suite also enjoys a panoramic en-suite bathroom with shower. The tower dependánce is located off of the pool deck, and entrance is either directly from the garden or up a flight of 20 steps to the tower. The tower dependánce is located on two floors. The bottom floor houses the full bathroom with shower, while the top floor enjoys a double bed, sofa, and a working fireplace, as well as panoramic views. The dependánce does not have air conditioning, but a portable unit is available, upon request. 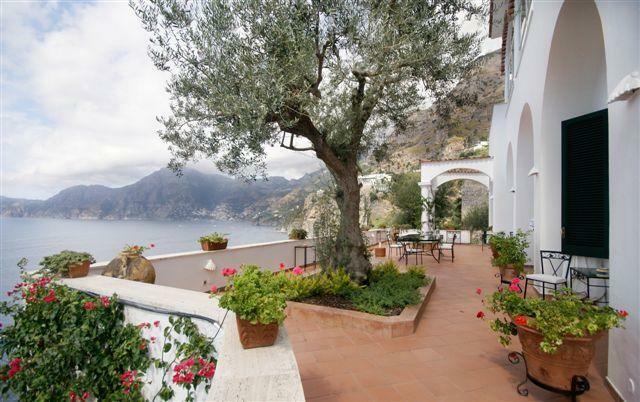 The beachfront apartment is found down the long path of steps that leads from the villa's pool deck down to the beach. 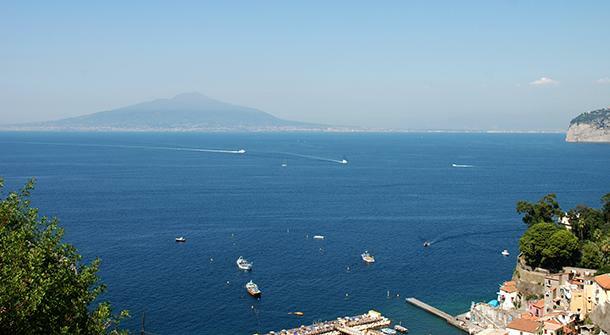 It is necessary to walk 164 steps from the pool deck to get to the beach apartment; however, it could very well be worth the walk. Although the unit has a couch, which pulls out to the double bed, it enjoys a fireplace, a lovely, beachside terrace and en-suite bathroom with shower. 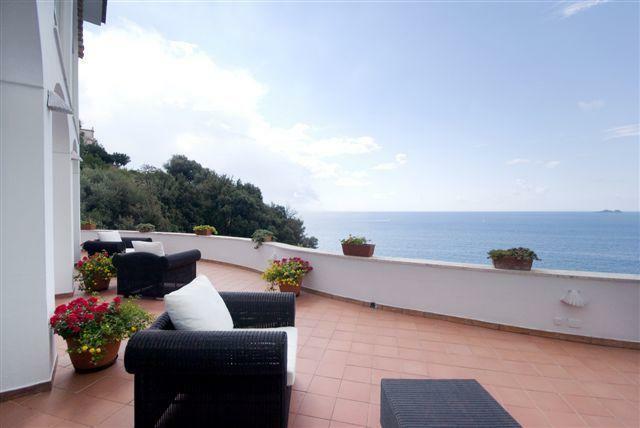 The unit is located 38 steps up from the beach, where there is a public bathing facility and a nice, seaside restaurant. 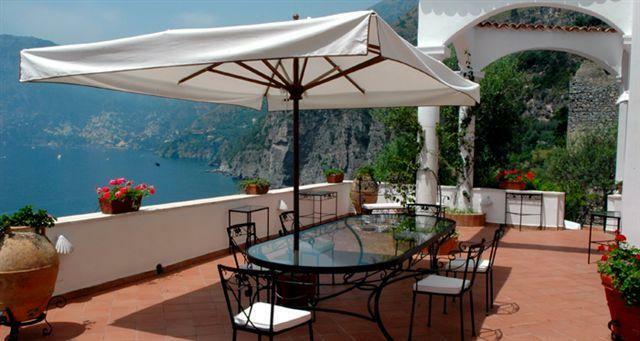 Guests can rent umbrellas and beach lounge chairs and food can also be delivered from the restaurant and brought up to the villa. 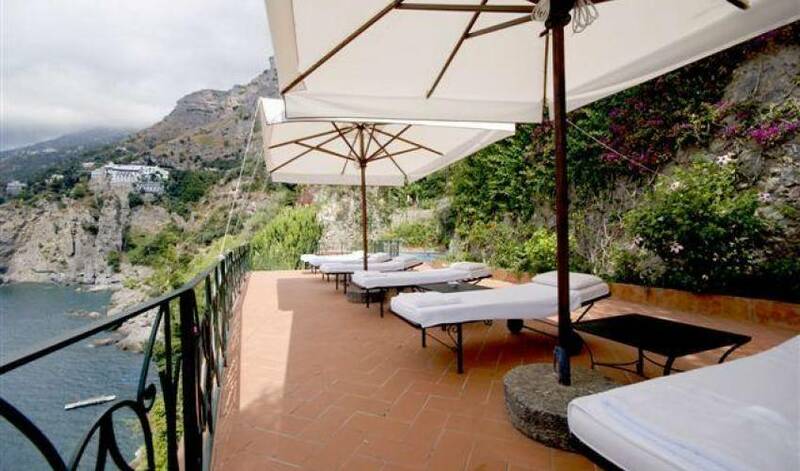 The gardens of the property cover about 33,000 square feet and boast a large, panoramic terrace at the front of the house, with a large, glass dining table and seating for 8, overlooking the Amalfi Coast and Positano. 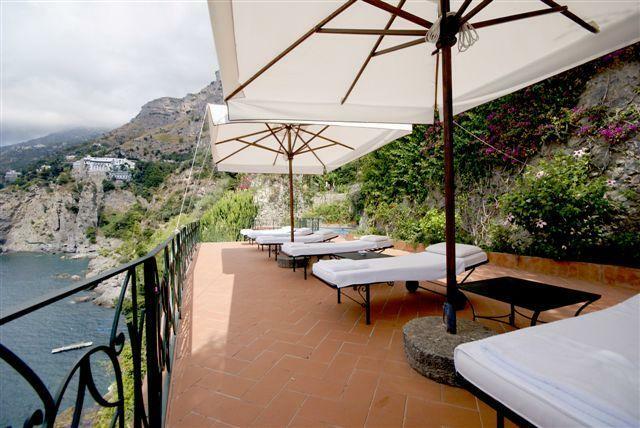 This terrace bleeds onto a second, panoramic terrace with large lounge chairs, small sofas, and coffee tables. Closed circuit video surveillance in house. Satellite TV throughout. Each bedroom boasts stereo with CD player. DVD in living room. Laptop given in study. Vegetable garden supplies kitchen with eggplant, salad, tomatoes, green peppers, zucchini, and hot peppers.